Cristina Díaz Moreno and Efrén García Grinda hold a MArch (E.T.S. 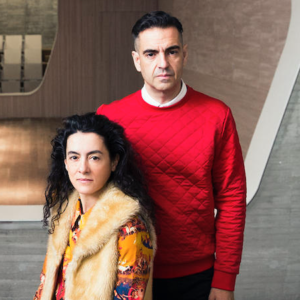 de Arquitectura de Madrid, Universidad Politécnica de Madrid) degree and are co-directors and co-founders of amid.cero9, an experimental architectural practice based in Madrid. They are currently Visiting Professors at the Institut für Kunst und Architektur, Akademie der Bildenden Künste IKA, Vienna, Diploma Unit Masters at the A.A. School in London since 2009 (on leave during the 2018-2019 academic year) and Visiting Critics at SOA, Princeton Universtity since 2017. Recently they have been Design Critics in Architecture and co-directors of an Option Studio at the GSD (2015-2017), Harvard University and Visiting Professors and Unit co-directors in the SAC StädSchule Architectural Class (2016-2017), Frankfürt StädSchule. Previously they have been Visiting Critics and Associated Professors in many universities all over the world. Their work is part of the Permanent Collection of the Pompidou Center in Paris and has been exhibited in the Biennale di Architettura di Venezia in the Official Section in 2010, 2004, 2000, in the Spanish Pavillion in 2014 and 2002 and in the Greek Pavillion in 2014, among others. Their projects have been widely disseminated and they have won more than 40 prizes in national and international competitions. The projects and writings of their first fifteen years were documented in 2014 in a publication entitled “Third Natures, a Micropedia” and an exhibition at the AA, London. Recently a monographic issue about their works have been published in El Croquis nº184, as a continuation of the several publications in El Croquis as collaborators and as AMID.cero9 architects. amid.cero9 cultivates a post-digital, afterpop approach to the contemporary notion of space that enlists sociology, technology, media, politics and representation in projects ranging from architecture (Cherry Blossom Pavilion in Jerte Valley, Spain, shown at the 12th Biennale di Venezia, Giner de los Ríos Foundation in Madrid, Diagonal80 Industrial Pavillion in Madrid) to design (ESA Pavillion), ecosystemic studies (The Magic Mountain in Ames, We as a plague in Rome, TRP in Venice) and hybrid urban projects (Aijalaranta in Jyväskylä, or Hhouse in Balearic Islands).